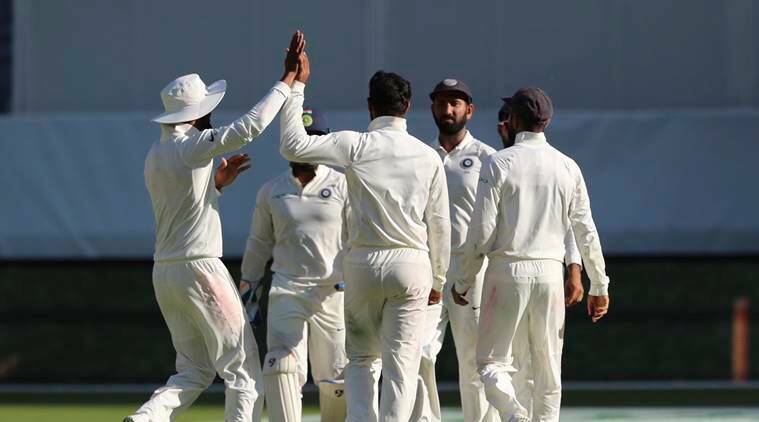 Ind vs Aus 2nd Test Day 1 Highlights, India vs Australia 2nd Test: Having won the toss, Australia reached 277/6 at close on Day 1 at the Perth Stadium. Ind vs Aus 2nd Test Day 1 Highlights, IND vs AUS: All the noise and expectations of the Perth Optus Stadium being a pace and bounce friendly track proved to be bit of an aberration and that saw India going in with four seamers in the second Test. After a 100-run stand for the opening wicket, Australia lost a few quick wickets to lose way before Shaun Marsh and Travis Head built another stand for the fifth wicket. Under hot conditions, Indian seamers were made to toil but would consider it to be an even day with the hosts closing day one at 277/6. Marcus Harris scored 70, Aaron Finch 50 and then Travis Head 58 to come out as stand out performers. For India, it wasn’t the seamers but part-time spinner Hanuma Vihari who accounted for key wickets (Harris and Marsh). Ishant Sharma, too, picked up two wickets on a day he had issues with his line and length early on. Australia finish the opening day of the second Test at 277/6. Bumrah pings Cummins on the pad but there is a bottom edge on it. The ball stays low and Australia don't add another wicket on the last ball of the day. Tim Paine unbeaten on 16 and Pat Cummins on 11. India have taken the new ball and Mohammed Shami gets first crack at it. Hanuma Vihari strikes for the second time and Shaun Marsh is dismissed for 45. Plenty of credit to Rahane at first slip to react quickly and hold on. Australia are 232/5. Vihari sticking to the outside the off side channel and is rewarded for it. Quick delivery outside off, Marsh goes for the cut, gets a thick outside edge which deflected off Pant's thigh and traveled quickly to Rahane at first slip - who takes a sharp catch. Shaun Marsh, on 24, survives and it is put down by Rishabh Pant! Shortish delivery outside off by Hanuma Vihari, Marsh looks to cut, gets a thin edge. Pant was in position to grab that but hard hands meant the ball hit the palms and popped out. How costly will this drop be? Head was lucky to not walk away with a golden duck. The first ball he faced came off the gloves and few over second slip - Virat Kohli - and raced to the boundary. It was an impossible height for anyone to reach but lucky escape there. Anyhow, take a look at this beauty. Kohli takes a screamer at second slip and Handscomb has to walk! Back of a length outside off by Ishant, Handscomb tries the cut but its too close to his body. It takes the edge and flies to second slip, Kohli reaches out to his left and plucks it with one hand. That is a catch for the highlight reels. Australia 148/4. Umesh Yadav is pumped as he gets Usman Khawaja for 5. A patient knock from Khawaja but not enough runs on it. Australia are 130/2. Shortish and outside off by Umesh, Khawaja went back in his crease and looked to cut it away on the back-foot but only musters a thick outside edge to Pant. Sachin Tendulkar on the pitch: "I feel the wicket has quickened up a bit and as time goes by, it will only become harder and have more pace and bounce." Australia played well in the first session and have surely been more positive today. FOUR! FOUR! Marcus Harris with two confident boundaries off Shami in the second over post lunch. Also, one has stayed low. Very low. Shami and Harris share a laugh with the ball staying low and beating the off stump. Not out. INDIA REVIEW! NOT OUT! Mohammed Shami to Aaron Finch and it has been given not out for lbw. Virat Kohli looks livid. INDIA REVIEW! Fair delivery. No edge on that delivery and it is confirmed by Snicko. Ball tracking next - impact in line, pitching outside off but going over the middle stump. NOT OUT! INDIA LOSE THEIR REVIEW. Tough, tough over for Ishant Sharma. A much handy over for Marcus Harris. Ishant started with an errant line down the leg and Harris plays it towards the fine leg boundary for a four. Third ball of the over is a no-ball and it is cheered slightly by the Perth crowd. Fourth ball of the over is fullish and Harris pushes at it to beat the mid-on fielder. Next ball is on the other side and it beats the mid-off fielder now. Finishes the over by beating the inside edge. Rather worryingly, Ishant not breaching 130ks yet. Anthems? Done. Team huddle? Done. Australia openers Marcus Harris and Aaron Finch come out to bat. Ishant Sharma has the ball and he will bowl to Harris from round the wicket. SECOND TEST GO! Should India have played Jadeja? Former England captain Michael Vaughan reckons India should have gone for Ravindra Jadeja - not just for the spin factor but for his handy batting skills. Tim Paime: We are gonna have a bat first. Look obviously it is very warm today and I said this wicket, at the press conference as well, will crack up under the hot weather. Everyone has recovered really well and raring to go. We are happy to be batting first. We are gonna back our boys. We are trying to create an environment which is going to be a bit stable. It is great to be here as it is an amazing stadium. Virat Kohli: We would have batted as well. But not a bad thing to bowl on day 1 on a wicket which has a lot of grass. we are happy with whatever we are going to do. I have seen an ODI game happen here and it had quite a bit for the bowlers. Pretty excited about that as a bowling side. We will look to get in and make some inroads with the ball. It is a frest Test. Just another Test match for us. We are not taking anything complacently. We have to work hard for another victory. We are taking the confidence from the last game but not the scoreline ahead. Shane Warne is backing Australia to win this. Will it be that way? "Good luck to both teams in Perth today for the second test ! Sorry to all my Indian fans, but given the pitch conditions, a hard, green bouncy & fast pitch - I think the Aussies will blow India away ! I hope Starc finds his form & gets 10 for the match & Finch gets a big 100 👍"
Both teams putting in final touches and last bits of words of encouragement before the second Test begins. Michael Vaughan with the pitch report: "The live green grass will encourage the seamers. Expect plenty of seam and bounce. Don't rule out the spinners either. I would rather be a bowler this week". So are we going to see four seamers and no spinners?